Lakshmi is the goddess of wealth. In the Hindu pantheon, she the consort of Vishnu. She goes by many names, such as Padma, Sridevi, Shriya, Kamakshi, Minakshi, Madhavi, Satya, Svarnamayi, Hemamalaini, Kshirarajatanaya, Sugandhini, Vishnupriya, Subhaprada, and so on. A number of hymns, Puranas, slokas, sthuthis, Tantras are written in her name. According to the legends, she was born from the waters of the milky ocean during the churning of the oceans and given as a gift to Vishnu. She is especially worshipped on Fridays and during the important festival such as Diwali. Many temples are also dedicated to the goddess. Symbolically she represents all the supreme qualities, and powers of God. She is the splendor, radiance and abundance that flows from the Divine. All the positive qualities that you may find in the universe emanate from her. She is the source of all forms of wealth. At the physical level she is strength, material wealth, physical health, beauty and grace. At the mental level she is peace, happiness, positive attitude, and inner harmony. At the spiritual level she symbolizes all the yogic powers or the siddhas, selflessness, kindness, discipline and selfless service. As the consort of Vishnu, goddess Lakshmi performs the same duties as Vishnu, as the preserver of the worlds and their order and regularity. In the icons and images she is usually shown seated or standing on a lotus in waters with elephants in the background. The lotus symbolizes creation, beauty, harmony, diversity, stability, and support. The elephants symbolize strength and royalty. The owl is her vehicle which symbolizes fearlessness and the ability to see in darkness. Symbolically she personifies the following. 1. Prakriti: As the highest aspect of Shakti, Lakshmi personified the primal Nature or Mother Goddess. She is responsible for all the modifications and creative functions in the manifested worlds. 2. Materiality: As the source of all wealth, Lakshmi is the source of all materiality and objectivity. The world are created by her tattva (realities). 3. Eight forms of wealth: Lakshmi symbolizes all forms of wealth which include cattle, food grains, metals, minerals, etc. She is also the source of other forms of wealth, namely intelligence (buddhi), mental brilliance (medhas), strength (balam), courage (viryam), progeny, good health, cleanliness, happiness, pleasure, and so on. Traditionally she is considered the source of eight forms of wealth, namely creativity, stability, courage, strength, progeny, victory, knowledge, wealth. 4. Good Luck: As the goddess of wealth and fortune, the goddess also symbolizes good luck. In fact the word luck is derived from Lakshmi only. 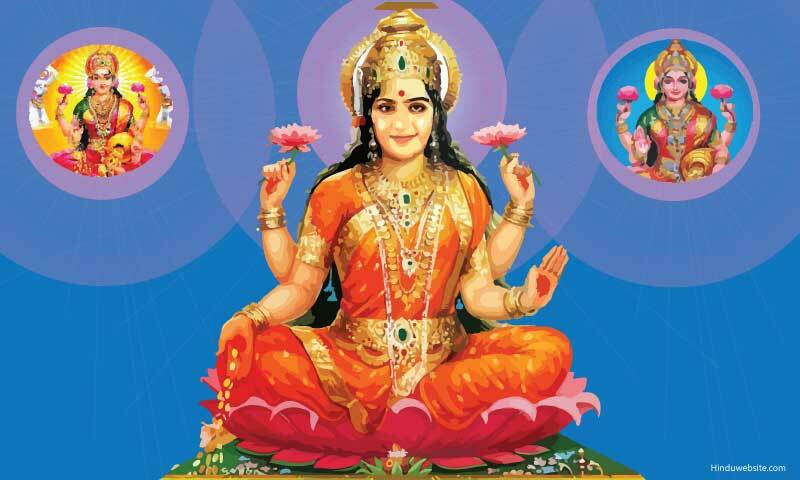 It is also believed that by worshipping Lakshmi one can drive away misfortune and inauspiciousness. Should We Call Hinduism Santana Dharma?